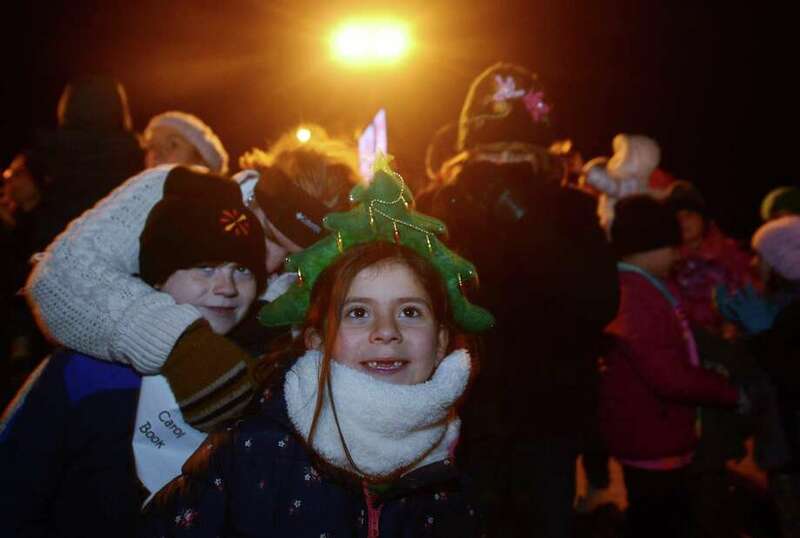 Carly Ramos, 6, of Fairfield enjoys the Christmas carols during Stew Leonard’s annual Christmas Tree Lighting celebration on Tuesday at the store in Norwalk. The festivities began with plenty of musical entertainment and ended with Santa spending the evening mingling with children and handing out candy canes. For the third year, a 30-foot artificial evergreen tree will serve as the Norwalk store’s holiday centerpiece. Created by American Christmas, Inc., the tree is hand-crafted by seven people over the course of a month. Once at Stews, it took 15 people more than 11 hours to put it up and string more than 33,000 LED multi-color lights. The artificial tree can be recycled at the end of its 6-year lifespan. Grammy-nominated choral group Seraphic Fire will perform a Christmas show with music spanning over 1,000 years at Trinity Episcopal Church on Dec. 2 at 4 p.m. Based in Florida, the group is known across the United States for their inspirational and transformative performances. Co-sponsored by WSHU Public Radio, the performance, part of the ensemble’s Seraphc Fire Christmas concert schedules, is for all ages. Their music will include well-known carols such as “O Come All Ye Faithful” and “O Little Town of Bethlehem,” and a number of Gregorian chants, a staple of their repertory. Since 2002, Seraphic Fire has brought together professional vocal and instrumental artists from around the country to perform music from medieval chants and baroque classics, to Brahms and contemporary composers. Tickets range in price from $25 ro $100 for students/seniors to a family package for five, as well as options for preferred seating. Trinity Episcopal Church is located at 651 Pequot Ave.
“You are not alone,” and “You Rock!” are examples of inspirational messaging found on colorfully painted rocks that will be strategically placed throughout the city of Bridgeport, according to a news release. A project of Youth to Lead Change, the rocks will also direct people, particularly young adults, to call 211 if they are homeless and need help. Y-TLC works to improve policies, programs and services directed at homeless youth. With the help of local artist Alicia Cobb, the Rock Project is the first of many initiatives the group is working on to reach young adults who need help and improve access to resources. In Fairfield County, there are 1,032 homeless and unstably housed youth and young adults under the age of 25, according to the 2018 CT Youth Count. NAMI Fairfield, a community organization providing support and education for people affected by mental illness, will feature Dr. Hilary Blumberg, of the Yale School of Medicine, to discuss bipolar disorder and understanding its brain circuitry on Dec. 5. Blumberg will discuss the differences that underlie mood disorders, the associated risk of suicide, the circuitry changes in mood disorders across the lifespan, and offer better understanding about bipolar brain research, new treatments and how to help loved ones. Blumberg is the John & Hope Furth professor of psychiatric neuroscience; professor of psychiatry, radiology and biomedical imaging in the Child Center, and director of the Mood Disorders Research Program at the Yale School of Medicine. Blumberg’s presentation will take place from 7:30 to 9 p.m. at the First Church Congregational, 148 Beach Road in Fairfield. For the 33rd year, Santa will make a special stop at Fairfield’s historic Burr Homestead to mingle with visitors of all ages. Hosted by the Junior Women’s Club of Fairfield, “A Visit to Santa’s House” will kick off Thursday with it’s “Santa’s House After Dark” event, and continue throughout the weekend. The Burr Homestead will be transformed into a winter wonderland for the JWC’s annual fundraiser, the proceeds of which will support The Friends of the Fairfield Library. Young visitors can make holiday crafts to take home, experience live entertainment including music and dance, eat a treat from the bake shop, check out the model train display, and more. Additional festivities throughout the weekend include holiday trivia, an ugly sweater contest, and performances of “The Nutcracker” by Flash Pointe Dance . The event will take place Thursday from 7:30 to 11 p.m., Friday from 6 to 8 p.m., Dec. 8 from 10 a.m. to 4 p.m. and Dec. 9 from 10 a.m. to 2 p.m.
Tickets are $7 for advance tickets for adults and children ages 2 and up. Tickets at the door are $10 each. For more information, visit www.jwcfairfield.com. Operation Hope of Fairfield is honored to have been awarded a $22,500 grant from Near & Far Aid. The grant will be used to support the general operating fund, which includes financing for the new Homeless Response Center, food pantry and affordable housing program. Through these programs, Operation Hope is able to offer both immediate assistance, as well as long-term solutions, to the issues of hunger and homelessness. Local families and individuals who are homeless or at risk of homelessness come to Operation Hope needing emergency services and seeking the hope for economic security. The Homeless Resource Center and food pantry provide day-to-day basic needs as individuals and families rebuild their lives with assistance through clinical support and case management. Affordable housing and ongoing community support services help provide security and stability for previously homeless households as they continue to work on their goals of housing maintenance, self-sufficiency and independence.